#2, the beret, is so so so pretty! Totally obsessed with anything lips! love the rhinestones! that brooch is the best! Red lips is where it’s at for fall and winter! red red red red – I love Colorfest Mondays! Thanks for including Amelia in this red hot colorfest!! Love the round up. XO!! love that little beret…I’m happy our LA weather is finally starting to turn on us- time for fall knitted hats!! I’m not usually a fan of red, but I love everything you’ve featured here! Lovely! oh I like that lips brooch! the red frames are just gorgeous–great post! 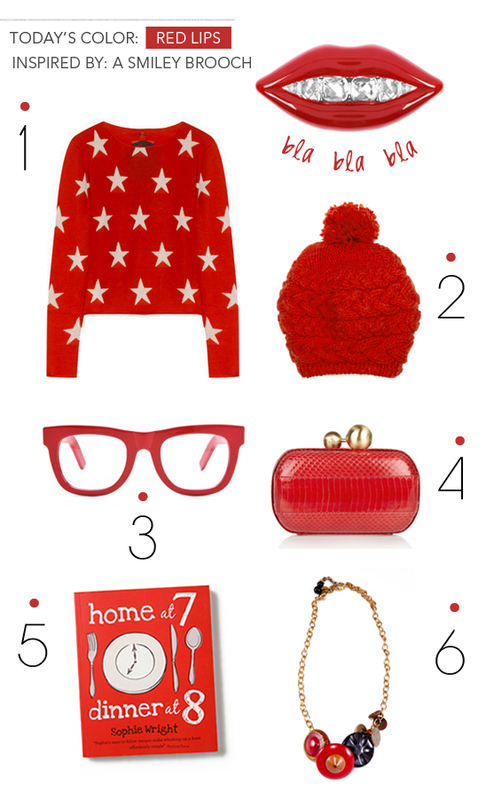 I love me some red and those glasses are amazing! I love this collection – my favorite item is the lips with the bling teeth!! Love it! The glasses and necklace are my favorites! LOVE YOUR IDEA OF CREATING A COLOR POST THAT S VERY CREEATIVE!